The global medical imaging equipment market is moderately concentrated with the top four players accounting for a 51.0% share as of 2014. These companies are Philips Healthcare, GE Healthcare, Siemens Healthcare, and CareStream Health, Inc. These players lead the market with wide product portfolios, robust distribution networks, and extensive geographic presence. Most of the major players in the market offer all modalities and are aggressively focusing on emerging markets through collaborations with local imaging providers and offering refurbished equipment in low-income countries. In the medical imaging equipment market, several structural and functional imaging technologies are relatively new. However, the origin of structural imaging dates back to 1895 when x-ray imaging was developed and still continues to account for a fair share of the market as a segment. Imaging devices such as magnetic resonance imaging (MRI), computed tomography (CT or CAT), and ultrasound have allowed further options for treatment guidance, essentially with very low morbidity. More recently, nuclear imaging equipment such as PET and SPECT scanners have facilitated in achieving tasks in the field of medicine such as location tumors in the brain and heart. The global medical imaging equipment market was valued at US$27.7 bn in 2014 and is expected to reach US$45.3 bn by 2023, expanding at a CAGR of 5.6% during the forecast period. By product, the x-ray imaging segment accounted for a 29.9% share in the market and is likely to maintain its leadership position during the forecast period from 2015 to 2023 at a healthy CAGR of 4.5%. Factors such as the increasing incidence of diseases diagnosed using this imaging technique (such as oral diseases and orthopedic conditions) and product enhancement and upgrade in the form of device portability are likely to drive the market. Moreover, digital x-ray systems are contributing to the growth of the market in terms of revenue due to a surging demand for these products across the world. Newer and better imaging technologies such as nuclear imaging and computed tomography (CT) are expected to witness high adoption levels by the end of the forecast period. The markets for these two product categories are projected to expand at a CAGR of 6.1% each during 2015 to 2023. 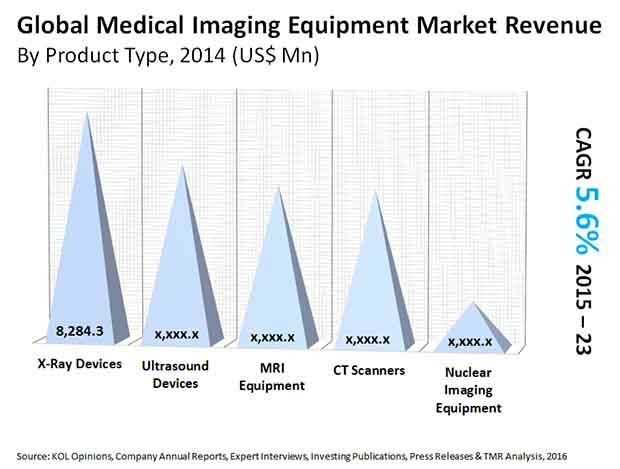 Geographically, North America dominated the global medical imaging equipment market in 2014. The market in the region is anticipated to reach US$13.5 bn by 2023, expanding at a CAGR of 4.6% during the forecast period. The rising incidence of several diseases such as oral, respiratory, orthopedic, and cardiovascular diseases is propelling the demand for diagnostic imaging equipment. According to the report, the growth of this market is expected to be steady owing to various factors such as an increase in government initiatives to make these imaging services affordable for patient population by offering favorable reimbursement policies. In addition, a rise in the incidence of various diseases such as cancer and stroke, an increase in the global geriatric population, and the introduction of technologically advanced products will enhance the growth of this market effectively. The report notes that three-dimensional (3D) medical imaging equipment, which offer greater accuracy and rapid diagnoses are gaining popularity. However, the report remarks that this growth may be hampered due to the low adoption rate by physicians and the imposition of excise duty for the sale of equipment.